On Thursday, November 30th at 11:30am, I visited for the first time the Lakeview Senior Center’s (LSC) Rose Garden Café to have lunch, which is served Monday-to-Friday, from 11:30am to 12:30pm. Upon first entering the café, a little sign asks for a $4 donation for those 60 and older, and $5 for those 59 and younger. I couldn’t imagine a more discreet “ask” — the donation box is hidden from the view of others. Since I didn’t see the friends I was supposed to meet there, I spotted a table with one fellow seated, and asked if I could join him. My preference is to sit with people I don’t know and make new friends. He enthusiastically invited me to have a seat. A few minutes later, when my friends arrived and spotted me, I excused myself and joined them at a nearby table where six other people were already seated. First came introductions: Robert, 91, is East Indian with a Scottish background. Tommy, 70, is a Mohawk Indian who was born on the reservation in upper New York State. Alan and Mary, who invited me to join them at lunch, are Jewish with Russian and Lithuanian heritage. Zafar, 71, is from Pakistan, and has been in Irvine about 3 years. Finally, Augustine, 61, an African-American, who was born in Louisiana but has lived for many years in Northern and now Southern California had an interesting perspective on being black in Irvine. One of several topics of conversation was offered by Zafar, who suggested that meeting new people at lunch is a wonderful way to create a better understanding of Irvine’s diverse residents and increase harmony in our community. Ironically, Zafar had been sitting at the same table with mostly the same people for many months, as he sadly acknowledged. Upon entry to the misnamed café — since its service is that of a restaurant — I was given a card to indicate whether I wanted a vegetarian or featured meal. On this day, the featured lunch was wild cod with vegetables that couldn’t be beat — it was plentiful and wholesome, served in a real restaurant environment with great waitperson service (all volunteers). Cubed pineapple was the dessert. After lunch, I left the table with Zafar, and he pointed outside to a ping pong table on the patio. Since I always found ping pong an engaging form of exercise, I asked Zafar if he would play with me. I hadn’t played in years. So, I went to the front desk to find out how it works. I signed a book reserving a time for immediate play and was invited to take a couple of paddles and a ball from a drawer at the front desk. We started playing, when two Iranian women came by to watch. Soon after, we invited them to challenge us. I played with one of the women and was amazed at how good she was. Ping pong must be an international sport. I worked up a good sweat with my aggressive style that’s more strenuous than accurate. After several rounds of informal games, Zafar wanted to go to the “Little Big Band Dance” session that began at 2pm. 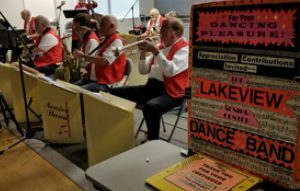 Remarkably, the dance hall had a professional caliber dance band, the so-called “Senior Band.” Being of limited inhibition, I danced solo to some great tunes, and worked up another sweat. 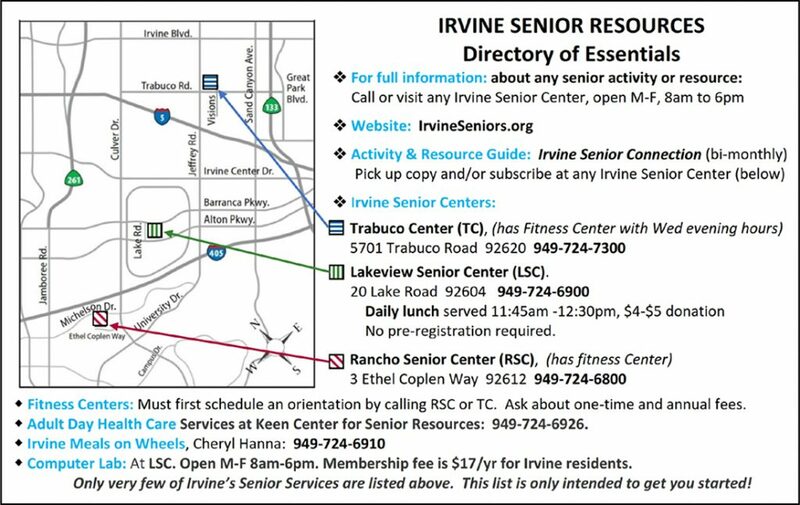 You must be getting the idea: Irvine’s Lakeview Senior Center offers a great restaurant, live music, dancing and other recreational opportunities in an environment of remarkable cultural diversity. Finally, for homebound seniors ages 60 and older who cannot prepare or shop for meals themselves, the Lakeview Senior Center prepares and delivers scores of “Meals on Wheels” every day. 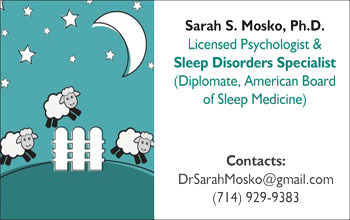 [See Directory for phone number.] Although the suggested donation is $5 per day, no qualifying adult will be turned away. NextScience, Technology, and Environment: Calling for an Irvine Climate Action Plan — Now!